The combination of Mobility, Cloud and Internet of Things is driving a revolution of connected devices, with more than 50 billion devices expected in 2020 compared to 10 billion today. Thus, the surface area for potential attacks will grow 10 times larger in the next five years. The trend is very visible today as Cyberattacks are increasingly getting more frequent, more sophisticated and more widespread than ever before. The new age cyber threats are driven by external attackers or insiders with malicious intent. It is very hard to detect internal threats as the traditional security platforms and products are incompetent in tracking or analysing the user behavior. The demand for solutions that can defend against both external and internal cyber threats, coupled with the worldwide scarcity of trained cybersecurity professionals, became the basis for creating the behavior based automated threat Detection system. We at Happiest Minds believe that Machine Learning and Artificial Intelligence driven Behavioral Analytics is the fulcrum for helping Predict, Prevent and Defeat cyberattacks in this age of increasing attacks/ threats like Advanced Persistent Threats. Cyber Analytics Platform from Happiest Minds is an enterprise grade security analytics and visualization platform focused on behavioral analytics of high velocity, real-time contextual enterprise data. Combining Big Data Technologies, Machine Learning and patented Algorithms, the Cyber Analytics platform helps discover insightful information and actionable cyber threat intelligence around security risks, targeted attacks and more. Why Cyber Risk Protection Platform (CRPP) with Next Generation Cyber Analytics? CRPP with Cyber Analytics capabilities leverages Machine learning, Big Data, Trend Analysis, User Behavioral analysis (UBA), Entity Behavioral Analysis (EBA) and other techniques to identify anomalous behaviour, activities or trends of individual users, systems, and/or applications in an enterprise. The platform can monitor user accounts, end point devices and can be embedded in applications and networks in an organization. It combines the data collected from various network & end points to derive intelligent insights on the potential security risks in organizations that the cyber criminals may exploit. The self-learning platform continually adapts with repetitive usage and helps organizations build better security posture to defend the ever evolving cyber threat landscape. The Cyber Analytics platform also helps enterprises address the current challenges with traditional security infrastructure and respond to the new age IT security requirements in a much more efficient way. This next generation CRPP Cyber Analytics platform works on a service based model enablling a smoother integration with traditional to advanced digital IT infrastructures, to meet clients’ next generation security needs. 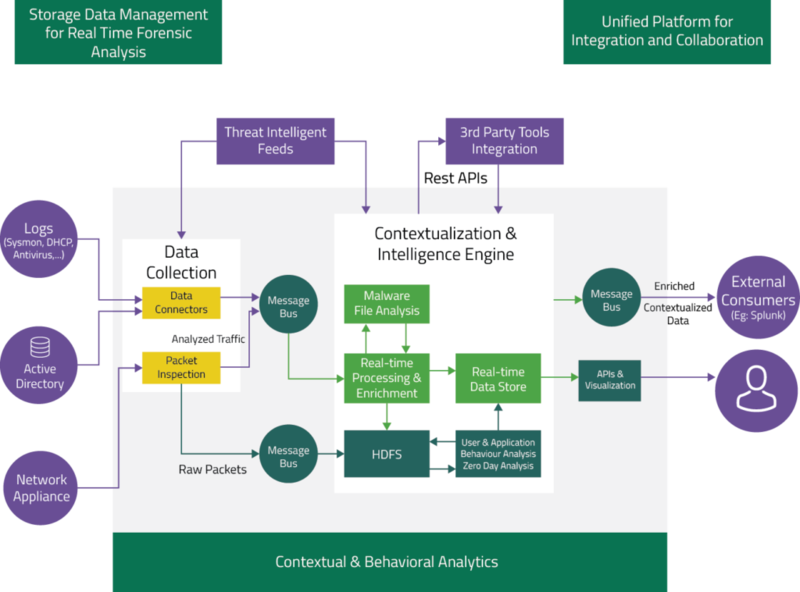 The Cyber Analytics solution from Happiest Minds helps enterprises to instrument a portfolio of security management, automation, and orchestration; simultaneously enabling threat hunting and driving rapid Incident Response. In successful UEBA deployments, the advantage comes from combining the specialized capabilities of UEBA with the broad visibility of SIEM. Successful overall incident management requires visibility and access to data and trends from throughout the SIEM architecture, which includes endpoint system and application data, threat intelligence, and asset profiles. Multidimensional understanding about users and analysts based on Machine learning. Reinforcement learning to automate Kill-Chain mapping and to distinguish malicious from anomalous.